Here is some interesting information about copper. Copper is a reddish brown nonferrous mineral, closely related with silver & gold. Copper is a trace mineral in our bodies. Throughout history copper has been used for medicinal purposes as far back as Egypt, Greece, Rome as well as the Ancient Aztec civilization. In the 21st century copper jewelry worn directly on the skin has been used to help with arthritis, however I use copper purely for decorating purposes. 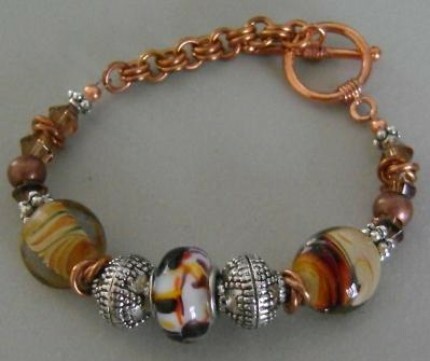 This entry was posted in Jewelry and tagged bracelet, copper, copper jewelry, jewelry, pandora style bracelet, pure copper.